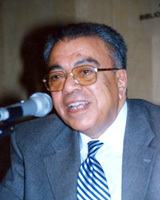 Dr. Salah Eldin Abdel Wahab passed away on 16 April 2009. Salah was a Founding Fellow of the International Academy for the Study of Tourism and organised a most successful meeting of the Academy in Cairo in 1995. Educated originally in the law, Salah earned a JSD from Cornell University, and was a senior partner of and Wahab & Nassar Law Office. He also had a distinguished career as a judge. Beyond his legal career, Salah’s work in tourism was extensive. He was Chairman of Tourismplan, an Egyptian-based consulting company and advised the United Nations and the World Tourism Organisation on tourism policy and development. His public service included Under Secretary of State for Tourism and Vice Minister for Tourism Development in the Ministry of Housing and Development. He was the Chief of Tourism Programs and Professor of Tourism at the Turin International Centre (Italy) of the ILO, a Member of the National Council for Productivity and Economic Affairs (Egypt), and Chairman of the Tourism Section at the Specialized National Councils of Egypt. Salah founded and chaired the Egyptian Society of Scientific Tourism Experts. He served as Professor of Tourism Management in the Faculty of Tourism and Hotels at the University of Alexandria. Professor Wahab extensively lectured on tourism topics in Brazil, Cyprus, France, Jordan, Iran, Italy, UK, and the USA, where he was Visiting Professor of Tourism at George Washington University for a number of years. He published widely on both legal and tourism topics. He wrote or contributed to books including Elements of State Policy on Tourism; General Theory of Tourism; Tourism Management; Tourism Marketing; Studies on Tourism Planning; Tourism Development and Growth: Challenge of Sustainability; Encyclopædia of Tourism; and Tourism in the Age of Globalization. Salah Wahab is an enduring symbol of the unique cultural and archæological heritage that Egypt offers the world of tourism. He made a substantial contribution to the development of tourism in Egypt, striving to ensure it would benefit both visitors and the citizens of the country he loved. Many Academy members have warm, personal memories of Salah’s – and his wife, Mona’s – graciousness as a host for Academy members when in Egypt.